My favorite breakfast is delicious, fast and skin friendly. Doesn’t my breakfast look good? So quick and easy. Zero fat greek yogurt has lots of protein in it – for beautiful skin, hair, and nails. It also has good bacteria for your guts – good digestion means less acne and redness. The fruit is full of anti oxidants for anti aging. Fruit fiber makes for good digestion for clear, calm skin. There’s a dab of pure maple syrup on there – lots of micro-nutrients in maple syrup pretty much make it a super food! 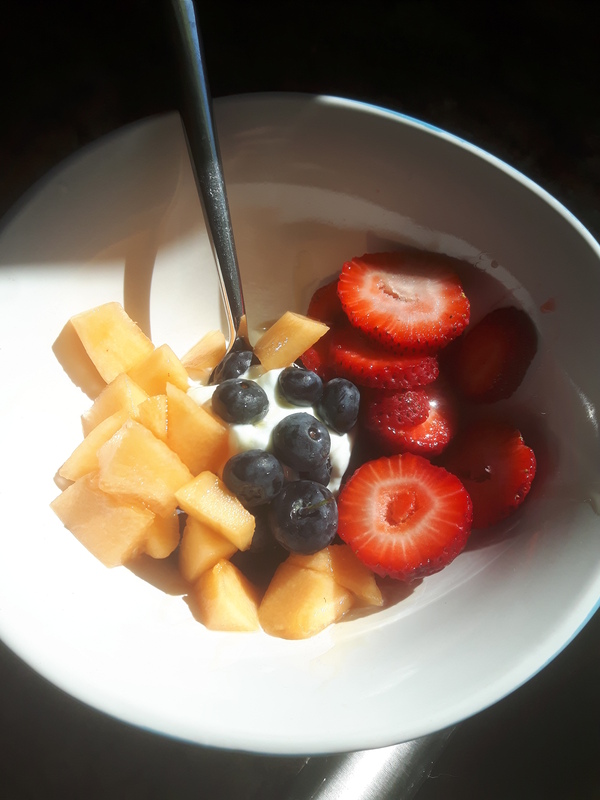 That same yogurt makes a quick and easy pre-work masque to reduce redness, acne and aging! Honest, I put lots in my bowl and a dab on my face. It feels good because it’s nice and cooling from the fridge. A little pre-work beauty prep and a full tummy and we’re good to go!